production critical 3D CAD/DCC + VR/AR + Animation/Model translation, optimization, reduction and viewing. Excellent and complete support for the most popular 3D MCAD/CAD and DCC/Animation file formats, including the most technically accurate and robust bi-directional conversion system between 3ds Max and Maya. Okino is an engineering R&D company with our first and primary focus on the conversion of huge 3D files. The software is best understood as a "stepping stone", allowing very large source files to be imported then whittled down such that lesser destination programs can import the final optimized dataset. This is one of the most important aspects of Okino software, but little known to uninitiated users. There is no other known similar software on the market that can perform such "stepping stone" conversions, as Okino software is well known for providing. Some real examples of such massive conversions can be viewed online: here (BP Clair Ridge oil & gas platform installations), here (BP Clair Ridge oil & gas platform construction) and here (CB&I oil refinery). PolyTrans is our lifeblood. We develop, maintain, (continually) tweak and support it around the clock. Data translation is a very critical business for which Okino's professional production customers demand perfect conversions. 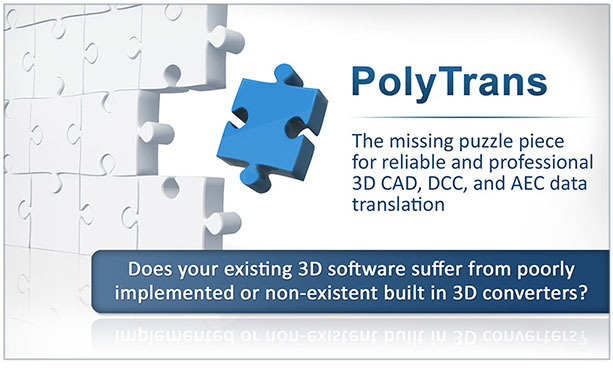 The software incorporates hundreds of man years of development and over 3 decades of customer usage, testing and refinement which has made PolyTrans the main conversion system used throughout the 3D software industry. Okino does not use reverse engineered CAD modules as is done by others, but rather licenses, utilizes and/or accesses the industry standard CAD geometry engines from Autodesk, Dassault Systemes (CATIA), PTC (Pro/E & Creo), Solid Edge, SolidWorks, Siemens (JT Open toolkit) and others. This is a little understood and/or easily overlooked aspect of those purchasing conversion software. The next time you look at other programs, ask their developers where they license their reverse engineered CAD modules (most such companies license their conversion technology from France, Russia or India, yet market it as their own). Okino pioneered the 3D data cross-conversion industry, particularly its robust support for all major crack-free CAD formats, bidirectional animation conversion, skinning conversion and the first to bring "Load & Render" conversions to market, among a long list of interesting innovations. PolyTrans has the most conversion options bar none. A few examples: 1, 2, 3, 4, 5, 6, 7, 8, 9, 10, 11. These options reflect the depth, complexity and completeness of our converter modules. We spend years to decades writing each converter, not weeks. Batch conversion of 3D file formats as well as all supported 2D bitmap file formats, including scene optimization functions during batching (reduction, optimization, scene scaling, etc). Personalized & fast turn around on technical support problems, with customer driven product development. All your questions will be answered almost immediately by our senior developers, or most often our CEO who has 3 decades of 3D graphics experience. Our customers are often quoted as saying "PolyTrans is an excellent product" and "It really works". Consider the fact that PolyTrans is in use continually around the world by almost all 3d users and companies, and hence the software is extremely well tested and robust. PolyTrans attacks and overcomes all the hardest translation problems. Handles all forms of geometry, including NURBS (& trim curves), crack-free handling of BREP solids, meshes with holes plus all attributes, NURBS curves, all varieties of spline curves and polylines. Accessible to OEM volume vendors and plug-in developers. Developed by some of the most experienced Okino CAD and animation developers where quality, robustness and completeness has set apart our converters from all others. We know data translation intimately, from the very bit-level of each file format up to the top-level politics, and the common day to day usage patterns of most of our customers.